18551 Council Crest Drive, Odessa, FL.| MLS# T3104937 | Westchase Real Estate - Westchase FL Homes For Sale - Westchase Local Experts. 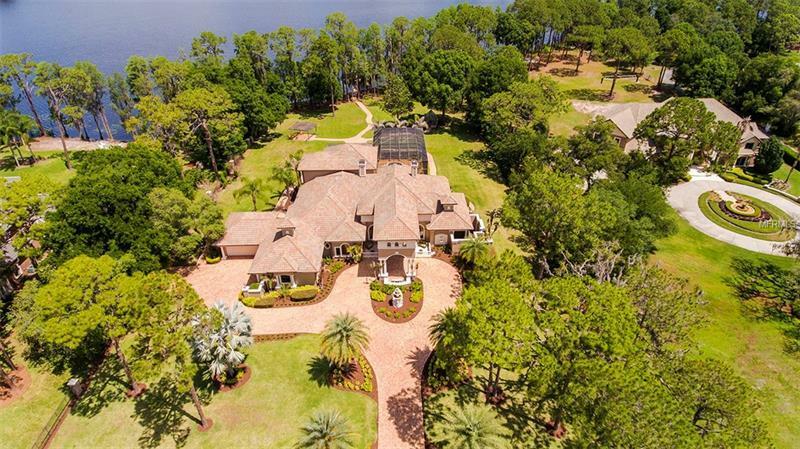 This impeccably designed tropical estate sits on 2 acres ideally situated on Island Ford Lake. Upon entering the magnificent property, your eyes are greeted by fine craftsmanship and designer touches including high coffered ceilings, chiseled travertine floors and beautiful stone finishes. The exquisite chefâs kitchen featuring top of the line deluxe appliances, including Wolf gas cooktop and double ovens, a large center island with prep sink, and an adjoining butler's pantry with wine cellar all open to the richly appointed family room for social gatherings or celebrations. The main living level features four generously sized bedrooms with en suite baths, including a spectacular master suite, as well as a wonderful home office featuring built ins and wainscoting. On the second level, you will find a regal game room with a full wet bar, another full bath and a wonderful balcony overlooking the manicured park-like grounds and lake. Extensive floor-to-ceiling glass doors both downstairs and up, recess into the walls and create a 4 seasons resort lifestyle encompassing a sparkling waterfall pool and spa, surrounded by extensive pavered decking, lush landscaping and convenient summer kitchen, all backdropped by a scenic lake panorama. Other outdoor amenities include a composite dock with boat lift, a brick-paved pergola perfect for your fire pit and a wonderful greenhouse with running water and potting tables. A four car garage with many more photos in virtual tour! Furnishings may be bought separately.